If you’re trying to find a fireproof area rug, you might be disappointed by what we’re about to tell you. We hate to burst your bubble, but as far as we know, there is no such thing as a honest-to-goodness fireproof area rug. No rug is totally immune to fire, despite what a few people claim. There are hearth rugs that are made from fiberglass material that are very resistant to fire, but they’re still not 100% fireproof. 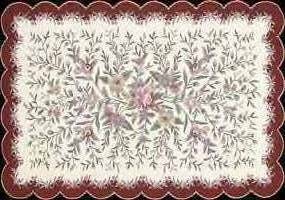 However, many people don’t care for the fiberglass material in a household rug. Also, there are specially made welding mats that are even more fire-resistant than hearth rugs, but who wants a welding mat on the floor of your living space? Don’t lose hope, because there is good news! Wool rugs are naturally resistant to fire. A wool rug offers protection for your carpet or wood floor from embers or rolling logs. A rug made of natural wool fibers may char slightly, but it can often be brushed clean. We should add that nylon rugs have a relatively high melt point, which means nylon rugs are more fire-resistant than rugs made from other synthetic materials (but not as fire-resistant as wool’s natural fibers). A burning ember can create a melt spot on a nylon rug, but the rug probably will not burn. Hmmm, a melt spot; how attractive is that? Okay, let’s get back to the good news about wool rugs. In addition to being naturally fire-resistant, wool rugs are also resistant to water and stains. Here’s more good news... If there are people in your household who have allergies, you should know that wool rugs are naturally resistant to dust mites. Allergies can be aggravated by dust mites, so anything that is resistant to dust mites is welcome in households where allergies are present. 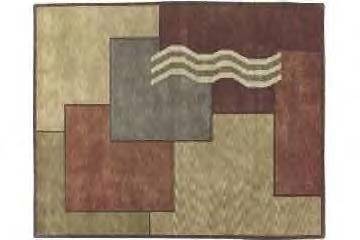 Here are some examples of the various styles and designs of naturally fire-resistant wool rugs you can find. This rug has a very contemporary design. The material for most wool rugs comes from sheep, but it can also come from goats, llamas, or alpaca. Wool is resilient and very durable. Although rugs can be made from many types of natural and synthetic materials, wool is one of the oldest rug materials and it’s still the best. the traditional Oriental rugs and the newer contemporary rugs. Wool is a favorite material in the traditional as well as the contemporary rug styles. Wool makes for a great finished product whether it was hand-knotted, hand-tufted, flat-woven, or machine-made. The durability and resiliency of wool rugs make them a great choice for any room. Good-looking and long-lasting are just two of the attributes of wool rugs. They hold up well, even in areas with lots of foot traffic. So, while you might not be able to get a totally fireproof area rug, you can get the next best thing - a naturally fire-resistant wool rug. 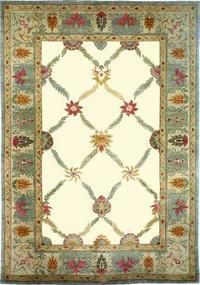 You'll be glad to know that wool rugs come in an amazing variety of designs and colors for any room in your home.